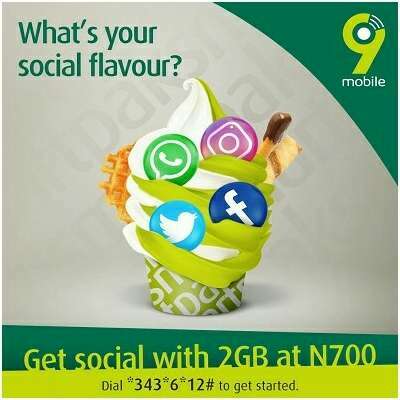 9Mobile socialpak is back in new dimension; now you get 2GB for N700 to stay connected on Facebook, WhatsApp and Instagram. But with AnonyTun VPN app, you will be able to use web browsers and power every other apps on your phone with this plan. Formerly Etisalat Nigeria, 9Mobile has the most expensive set of data bundles in the country but with the introduction of this new social pak, customers have a cheaper data plan to subscribe and get connected. Thanks goodness, the internet service for this mobile network is readily available and very fast so all will enjoy. To activate the 2GB for N700 socialpak plan dial *343*6*12# and 700 Hundred Naira will be deducted from your SIM. If you would like to deactivate auto renewal, dial *343*5*0#. Note that this plan is valid for 7 days and every 9Mobile customer is eligible for it. However after activating this plan, you will only be able to use it to access popular social media apps as that’s the original purpose for the plan. But if you want to use it to browse and power every other apps, apply this AnonyTun Settings for 9Mobile SocialPak. With that, you are good to go and will see this plan as one of your best plans.